I have been asked to explain exactly what ‘seconding’ at hop training is. 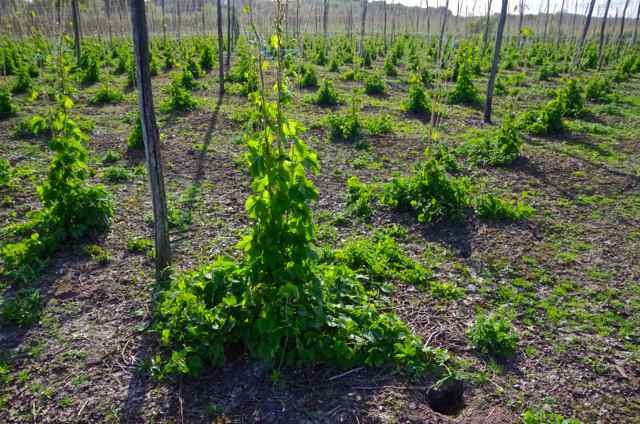 During hop training each year you will train each hop plant at least 3 times, normally starting in mid April and working throughout May until early in June. 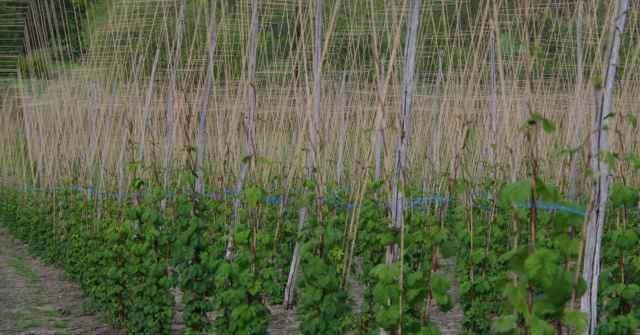 For ‘hop training’, ‘hop twiddling’ or even on occasion ‘hop tying’, these three visits per plant are called, rather unimaginatively, firsting, seconding, then finally heading. First things first, because when hops are done well the first time round this really does make a difference when you go back over them the second time around. 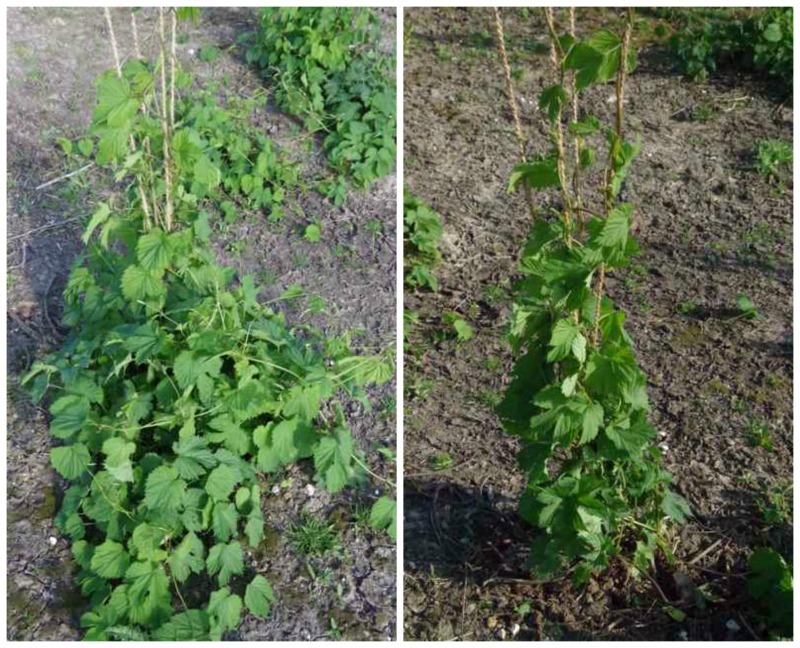 The exception to only firsting once is for young hop plants in their first year after planting as setts. We will walk over these as many times as necessary to put up all the bines they produce as soon as these are long enough to reach the strings. The young plants need everything up in order to make as strong a root system as they can for the following year. It takes 3 years from planting before you get a commercially viable crop off any new planting, hence this extra care and attention to detail is important to establish them well. A newly planted area is a commitment for any grower. Below is a garden due to be firsted. and a before and after of the same hop which has been twiddled for the first time round. It has been thinned right down to 6 bines and the rest that have been pulled out from around the bottom are left next to the plant where they will naturally disintegrate. As soon as the bines have grown above the banding strings then seconding can take place. At this stage they are roughly between 6 and 8 foot high. Basically seconding at hop training is simply tidying the hops up and making sure there are no bare strings or strings that have more than there fair share of bines. They are still easy to reach therefore they can be moved without kinking or breaking them. 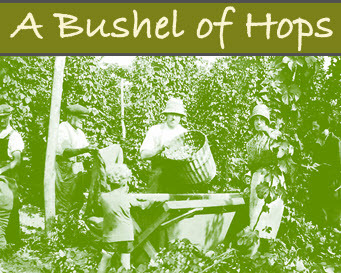 Below left is a hop waiting to be seconded, then the hops done in the centre and right is the garden immediately after it was completed. Even so in the picture on the right, you can see the heads immediately favouring the left side of the photograph and there was only the slightest of breezes. Each plant should have its correct number of bines e.g. 2 per string so if lots more have gone up you can cull out these extra bines at this stage too. If there are 3 bines up one string and an empty string next to it, you simply unwind one of them, cross it back over then twist it up the empty string a couple of turns so it is nicely secured. The hop strings are naturally closer to each other below the banding, which makes it easier for bines to crossover between one another. This would all be fine if they did it evenly, but generally if there has been a prevailing breeze they will tend toward one side of the plant. It is the easiest and quickest stage of hop training because you are walking along and working at a comfortable height you can cover the ground quite quickly. Gloves are generally not necessary now because you are no longer pulling out the bottoms, this in itself makes it pleasanter on a hot day. The other contrary thing they can do is to get themselves trapped. Either in a loop of the string or between the another bine and the string, the trapped head will stay that way and as the plant keeps following the sun it will eventually screw its head right off. 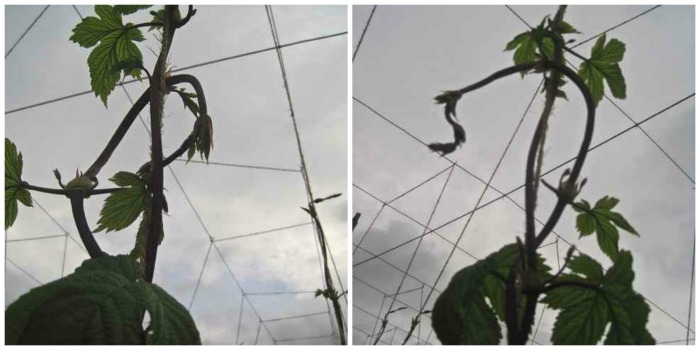 Below is a rescued bine before and after, it has not been put up the string as it will be brittle, so best left for now to go up on its own or if not it can be dealt with next time around. We are always careful not to break a head, by seconding there are no replacements to be had. Cold or windy weather make a difference to the brittleness of the bines and there are varietal differences too. If a head gets broken, you need to pinch out one of the side buds to allow the other to take over as the new leader. This helps, but a bine with a broken head wants to put all it laterals out and grow bushy like a christmas tree, it will not grow as well as one with its original head still on. 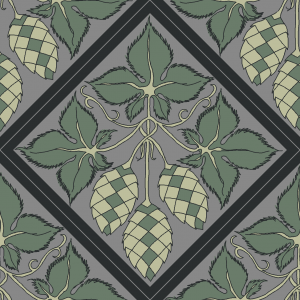 As with most hop work, numbers of people are needed. It is not hard physically but if you had for example 10 people doing one row each, them they move along to the next 10 rows, it is satisfying to see what you have done at the end of each day. Contrarily a single person hardly seems to touch a hop garden. Hops have always been like this, it requires people about when any seasonal job needs to be done. With so much hand work the ‘man hours’ required throughout the year really add up, this is one of several reasons which make hops such a high cost crop to grow and in turn expensive for the home brewer to buy. After seconding at hop training all fingers are kept tightly crossed for quiet weather, you definitely don’t want high winds to undo everything you have just done. Still, warm weather is ideal to get them up and over the top wires as quickly as possible, once over the top they are safe from being blown off the strings and we can all breath a sigh of relief. If that happens then minimal heading with twiddling sticks will be required – phew.